Sane Tatsu offers traditional design and craftsmanship with their Japanese Pro Chef Knives. The Sane Tatsu 240mm Gyuto Japanese Pro Chef Knife is an attractive knife that is very capable for work in a commercial kitchen or at home. It’s pricey, but has the premium features and aspects that you would expect from the highest quality japanese chef knives. VG 10 and 16 layers of Damascus creates a very sharp blade, which is honed to maximum sharpness by hand before shipping. It has a hammered finish, to increase the overall hardness of the metal and to help prevent food from getting stuck during use. The handle is made from laminated mahogany, secured with three stainless steel rivets. It’s a unique look, but the hardwood is strudy and provides a good grip. It’s well balanced, and feels natural in the hand. For a knife of this size, it’s also surprisingly light weight. Creating these knives with traditional Japanese techniques is something that Sane Tatsu takes seriously. Master blacksmiths devote time to each of these speciality blades, ensuring that they arrive in top condition and are built to last. Very good VG 10 stainless steel, forged by very skilled craftsman, served as the backbone of this blade. VG 10 is a very hard steel, creating an edge that will maintain its sharpness longer than other blades. The mahogany handle is a nice touch, and it creates a unique look compared to other japanese chef knives. It is triple riveted, and features a stainless steel bolster that gives this blade the requisite weight and balanced you would expect from Sane Tatsu. The blade sharpens very easily. Although this is one of the pricier chef knives, it doesn’t require an expert to keep sharp. Brief, routine sharpening can produce a consisntely sharp edge that will not dull quickly. Like other knives using very hard, thin blades, this chef knife can be prone to chipping. Some steps should be taken to avoid using this knife in an overly stressful manner. For example, using this knife to cut very hard vegetables or using this knife on a cutting board will increase the risk of chipping the blade. At first glance, the most noteworthy aspect of the Sane Tatsu 240mm Gyuto Japanese Pro Chef Knife is the impressive Damascus pattern and hammered finish. It bestows upon the blade a look of craftsmanship and tradition. The mahogany handle, while eye catching, is very sturdy and provides a secure grip for use by a professional chef or for someone cooking at home. 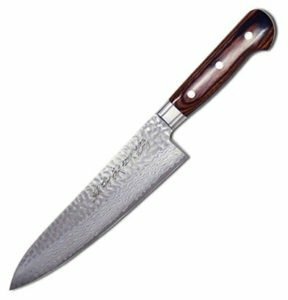 Sane Tatsu 240mm Gyuto Japanese Pro Chef Knife – This japanese chefs knife sits right in the middle of pricing, and that’s a fair spot. This blade does have a few features that let it fit in with higher end models, like the beautiful blade and the eye-catching mahogany handle. It’s fairly priced for a well built, good looking chefs knife.